Exploding Doughnut: Owl - Step 5 - Panic and Save! Owl - Step 5 - Panic and Save! I was wondering when it'd happen. That moment I'm always dreading. So I started laying in the blacks around the owl's eyes and beak only to see that it's much too dark for the rest of the painting! Thank God I opted for watercolors instead of ink as originally planned. With some careful maneuvering, I was able to blot and lift off most of the problem areas. 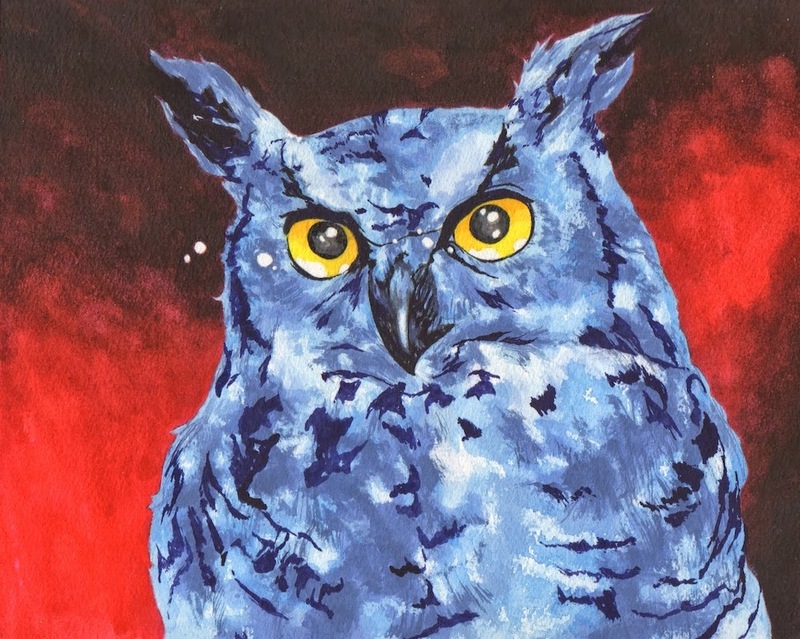 To have the owl entirely detailed in black would've killed a lot of the vibrant blues I worked so hard to save. If this were a pure comic book illustration it'd work but this owl falls a bit more on the fine art side. To remedy this, I created a deep darkish-purple, that from a distance appears black but doesn't swallow up the rest of the painting (click on image to see the purples at work). Now I just have to blend and soften the dark edges and add ALL those tiny, little detail hairs on the feathers. Everything should be completed by the next step. Let's hope! Looks good. It might have been interesting to see how the mistake looked, to compare it with the corrected version, butI guess nobody wants to put his mistakes on permanent display. Glad you were able to make it work. Love seeing the progress, Dean! I think it looks awesome so far. You can still see the initial "mistake". The outline around the eyes and the beak itself are still mostly pure black. Take a look and see. Then note the surrounding areas in the feathers are the corrected dark purple. Everyone's feedback is greatly appreciated! (Oh) what I wouldn't do.